Stripes are a pretty popular Web 2.0 craze over the past several years, dying down a bit. Even so, stripes have always been very popular and will continue to be. Googling until I’m annoyed is usually the conclusion I reach when trying to find something solid, something really good… and then I just do it myself. Whenever this happens, I tend to like to share to save others from the same headache later. I did try some plugins and looked at some patterns, they are there to be found. I wasn’t really pleased with any of it. Either it was too simple and useless or too complicated or fancy. I like things to be easy, minimal, and clean. Most importantly, I like scripts and graphics in general to be generic to broaden the usability. First, I’ve provided the original PSD, I think this is an always important, but often overlooked part of providing Photoshop elements. I want you to be able to take the PSD and make your own exact custom sizes that may be needed for projects. It’s 300×300 pixels at 300 dpi, that should suffice most projects for web or print. 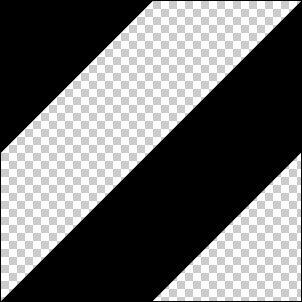 On the patterns, the stripes are black and the background is left transparent. You can simply do a color overlay on the stripes and set a background color on another layer or leave transparent. Then, when working in Photoshop, simply select the paint bucket tool, change from foreground to patterns (select one of the striped patterns) and fill in a transparent, blank layer. It’ll automatically tile the whole thing! Couldn’t be better or easier. Yes, right now it’s just the basic diagonal stripe direction. If enough people bug me, I suppose I could do the horizontal, vertical, and reverse diagonal patterns too. Enjoy.